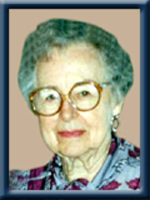 MANTHORNE – Evelyn G., 103, of Queens Manor, Liverpool, passed away peacefully on Monday, May 6th, 2013 at Queens Manor. Born in Port Medway, Queens County, she was a daughter of the late Everett and Dessie (Leaman) Smith. Evelyn was a secretary for many years working in the US. She is survived by her sons Richard (Anne) Guckert of Marietta, GA. and Ronald (Karen) Guckert of Broomall, PA., five grandchildren and three great-grandchildren. She was predeceased by her first husband Harry Guckert and her second husband Eric Manthorne, her sister Genesta Wylde and her brothers Archibald and Anson. Our condolences to the Richard and Ronald Guckert families. Your mother was a wonderful person and a dear friend. Always enjoyed visiting her along with her sister Genesta to get caught up on the local news. She will be greatly missed. In God We Trust. To the family of our dear, dear friend Evelyn. Knowing your Mom was so special and to have her friendship throughout the years meant so much. She and Genesta were wonderful and caring friends to my Dad, Herbert and remained so fiercely loyal and concerned as his health started to change. I will always keep close to my heart the wonderful visits up to her home in Liverpool with my Dad where we loved the company of them both..Evelyn and Genesta. My Dad lived on College Street, close to Cobb’s Ridge. We again made many visits to Bridgewater also and were so pleased to have her return to Liverpool where she could have contact with old friends again..I had just sent her a note in the mail and sadly she would not have received it but we wanted all of you to know how important she was to us and how special her friendship was. We loved them both so much. Please accept our condolences and know that your Mom was very special to so many people. To the family, words are not enough to express how sorry I am for your loss. I have prayed to God to provide you the strength and courage you need in order to handle this difficult moment successfully. We send our prayers and thoughts. She will truly be missed by so many. Please accept my sincere condolence. I didn’t know your Mom was even in Queens Manor,or I would have gone to see her.I will always remember sitting and talking with her next door,as she was a wonderful woman.I was proud to know her.I know she will be a great miss in your lives.It is with great sadness I say,i am so sorry you have loss your Mom.May God bless your families at the sad time. To Evelyn’s family I send my sincere condolences. Evelyn was my dear friend. We visited each other many times over the years. I admired her strength and character.The visits to her at Queens Manor are special to me especially seeing her on her 103rd birthday. I will miss her. Sincerely, Ruth MacCaul, College Street.